We often turn to the saints for intercession to God on our behalf. Saint Luke, the Evangelist, is the patron saint of physicians, surgeons and artists. A person who asks St. Luke for intercession may use one of the following prayers. the Heavenly Spirit of Love. If you like this prayer, you'll love this prayer card! compassion for all human beings. 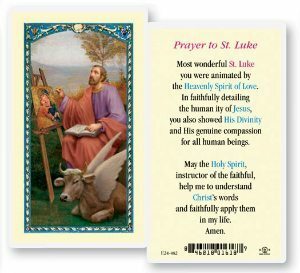 This prayer card comes included with a stunning Saint Luke Medal. by the heavenly Spirit of love. that afflict so many in our day. This beautiful bifold prayer card and medal combo is perfect for any physician. ST.LUKE PRAY FOR US AMEN.